This is claimed to be the loudest whistle in the world, and our tiny minds are boggling at the fun we could have sneaking up behind people and letting fly with this eardrum-busting squealer. Except we wouldn’t do that because that would be irresponsible. The Storm is designed so it even works under water – those water-polo players would reckon that was pretty good – and ‘creates a clear, high-frequency sound, with a power rating over 75% greater than other referee and safety whistles’. So that’s some powerful decibels right there. 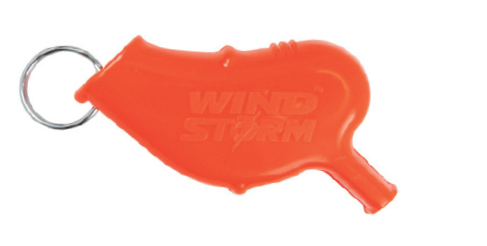 The Storm Whistle is used by the US armed forces, various US government agencies, police departments, NFL referees, the Red Cross and other organisations. It could add a whole new dimension to those whistle blowers on the current affairs shows on TV. Grab one from survivalsuppliesaustralia.com.au for $17.60.